The first Paul Broderick heard about being nominated for an All-Star was when his phone rang at seven in the morning and his father broke the good news. The Carlow star was still in bed and didn't really believe what he was hearing until a big hullabaloo was made about it when he went into Heywood Community School - where he teaches business and accounting - later that morning. Becoming the first Barrowsider to earn a nomination since Colm Hayden in 1994 is no mean feat but it is just desserts for his remarkable scoring returns in league and championship for the past two seasons. Broderick's cultured left boot helped Turlough O'Brien's side earn promotion to Division 3 as well as securing their first Leinster SFC defeat of Kildare in 65 years. As is his wont, the Tinryland attacker is quick to deflect praise from his performances and sees his nomination as an endorsement of the rising which is currently taking place in Carlow football. "Going back four or five years there wasn't a hope that any Carlow player could have gotten an All-Star nomination. "There weren't structures in place for players to be recognised because we weren't playing to a certain level," he said. "It's a credit to the current management that Carlow players are now being looked at in that way. That's only through winning promotion and beating Kildare. That doesn't happen by chance. "Carlow is a small place and the messages I've gotten from people that I know who go to these games and love Carlow football, their support has just been overwhelming to be honest." 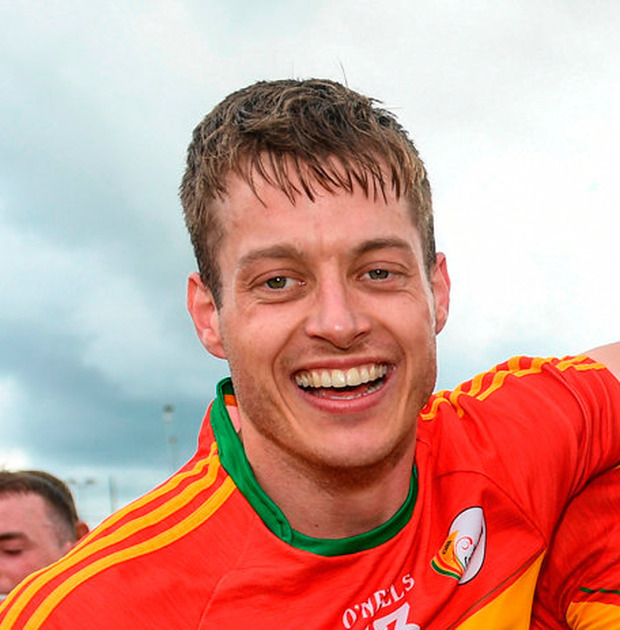 As well as O'Brien, Steven Poacher has played an important part in Carlow's progression and Broderick is delighted to have the Down native on board again as coach for 2019. "It takes a unique type of character to be able to travel down a couple of times a week from where he's coming from and to still hold the rest of his life together. "I've never met a coach with the level of enthusiasm and positivity that he brings. That's been huge for us. He's a huge part of where we are and where we've come from. "We play a brand of football that has suited us to try and build. Steven came in and I think we were conceding the most scores in all four divisions to being third across all four divisions in his first year. "He wanted us to build from a defensive point of view. And, to be fair, a lot of this criticism (of our style of play) is probably from people who haven't gone to watch a whole lot of our games."